The following exhibits were released May 21, 2013 by the Senate Permanent Subcommittee on Investigations Homeland Security and Governmental Affairs Committee. On May 21, 2013, the Permanent Subcommittee on Investigations (PSI) of the U.S. Senate Homeland Security and Government Affairs Committee will hold a hearing that is a continuation of a series of reviews conducted by the Subcommittee on how individual and corporate taxpayers are shifting billions of dollars offshore to avoid U.S. taxes. The hearing will examine how Apple Inc., a U.S. multinational corporation, has used a variety of offshore structures, arrangements, and transactions to shift billions of dollars in profits away from the United States and into Ireland, where Apple has negotiated a special corporate tax rate of less than two percent. 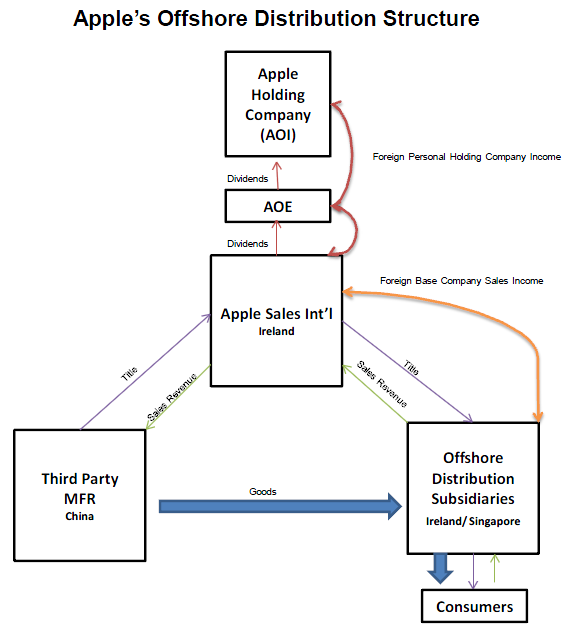 One of Apple’s more unusual tactics has been to establish and direct substantial funds to offshore entities in Ireland, while claiming they are not tax residents of any jurisdiction. 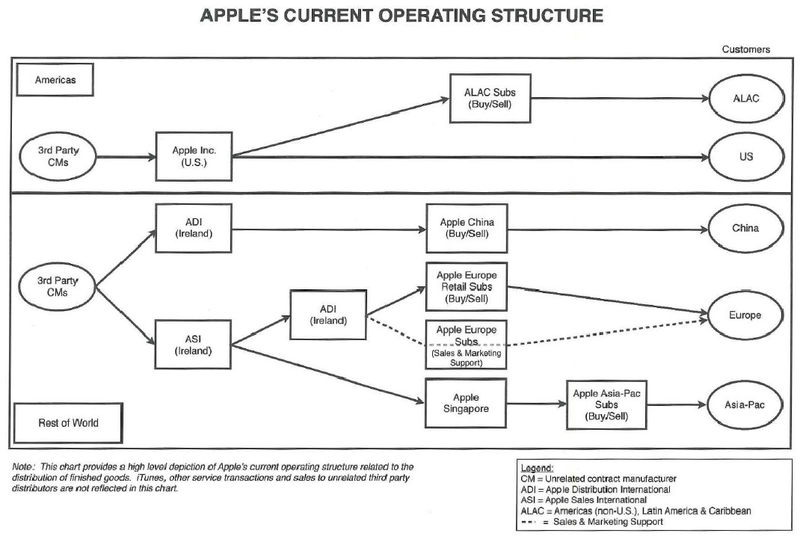 For example, Apple Inc. established an offshore subsidiary, Apple Operations International, which from 2009 to 2012 reported net income of $30 billion, but declined to declare any tax residence, filed no corporate income tax return, and paid no corporate income taxes to any national government for five years. A second Irish affiliate, Apple Sales International, received $74 billion in sales income over four years, but due in part to its alleged status as a non-tax resident, paid taxes on only a tiny fraction of that income. 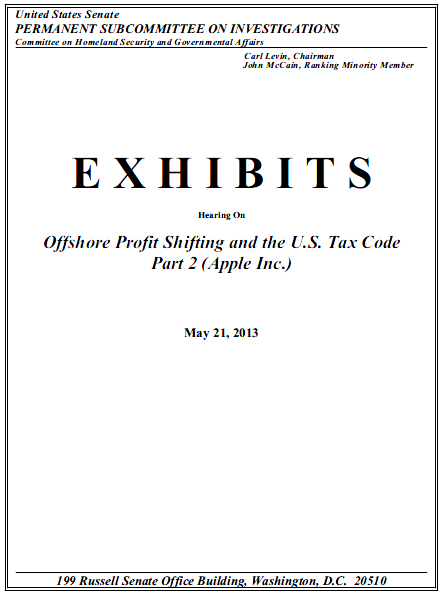 In addition, the hearing will examine how Apple Inc. transferred the economic rights to its intellectual property through a cost sharing agreement with its own offshore affiliates, and was thereby able to shift tens of billions of dollars offshore to a low tax jurisdiction and avoid U.S. tax. Apple Inc. then utilized U.S. tax loopholes, including the so-called “check-the-box” rules, to avoid U.S. taxes on $44 billion in taxable offshore income over the past four years, or about $10 billion in tax avoidance per year. The hearing will also examine some of the weaknesses and loopholes in certain U.S. tax code provisions, including transfer pricing, Subpart F, and related regulations, that enable multinational corporations to avoid U.S. taxes. For a number of years, the Subcommittee has reviewed how U.S. citizens and multinational corporations have exploited and, at times, abused or violated U.S. tax statutes, regulations and accounting rules to shift profits and valuable assets offshore to avoid U.S. taxes. The Subcommittee inquiries have resulted in a series of hearings and reports. The Subcommittee’s recent reviews have focused on how multinational corporations have employed various complex structures and transactions to exploit taxloopholes to shift large portions of their profits offshore and dodge U.S. taxes. Over the past several years, the amount of permanently reinvested foreign earnings reported by U.S. multinationals on their financial statements has increased dramatically. One study has calculated that undistributed foreign earnings for companies in the S&P 500 have increased by more than 400%. According to recent analysis by Audit Analytics, over a five year period from 2008 to 2012, total untaxed indefinitely reinvested earnings reported in 10-K filings for firms comprising the Russell 3000 increased by 70.3%. During the same period, the number of firms reporting indefinitely reinvested earnings increased by 11.4%. The Subcommittee’s investigations, as well as government and academic studies, have shown that U.S. multinationals use transfer pricing to move the economic rights of intangible assets to CFCs in tax havens or low tax jurisdictions, while they attribute expenses to their U.S. operations, lowering their taxable income at home. Their ability to artificially shift income to a tax haven provides multinationals with an unfair advantage over U.S. domestic corporations; it amounts to a subsidy for those multinationals. The recipient CFC in many cases is a shell entity that is created for the purpose of holding the rights. Shell companies are legal entities without any substantive existence – they have no employees, no physical presence, and produce no goods or services. Such shell companies are “ubiquitous in U.S international tax planning.” Typically, multinationals set up a shell corporation to enable it to artificially shift income to shell subsidiaries in low tax or tax haven jurisdictions. According to a 2008 GAO study, “eighty-three of the 100 largest publicly traded U.S. corporations in terms of revenue reported having subsidiaries in jurisdictions list as tax havens or financial privacy jurisdictions….” Many of the largest U.S. multinationals use shell corporations to hold the economic rights to intellectual property and the profits generated from those rights in tax haven jurisdictions to avoid U.S. taxation. By doing this, multinational companies are shifting taxable U.S. income on paper to affiliated offshore shells. These strategies are causing the United States to lose billions of tax dollars annually. Moreover, from a broader prospective, multinationals are able to benefit from the tax rules which assume that different entities of a multinational, including shell corporations, act independently from one another. The reality today is that the entities of a parent multinational typically operate as one global enterprise following a global business plan directed by the U.S. parent. If that reality were recognized, rather than viewing the various affiliated entities as independent companies, they would not be able to benefit from creating fictitious entities in tax havens and shifting income to those entities. In fact, when Congress enacted Subpart F, discussed in detail below, more than fifty years ago in 1962, an express purpose of that law was to stop the deflection of multinational income to tax havens, an activity which is so prevalent today.